« IKEA and Baltimore NAPO Bring Organization to Shoppers! If you have been following my blog, you met Jutz last week and you have gotten a glimpse of both her space and her personality. This IS going to be a FUN job! 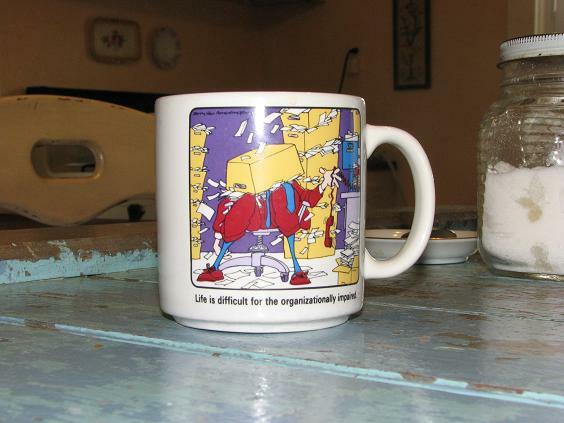 Life is Difficult for the Organizationally Impaired! Life is Difficult for the Organizationally Impaired”! But seriously, she is well aware that her organizational challenges are interfering with her productivity in her business. And she is ready for that to change! We will be focusing on her studio space. She works from her studio within her home, which houses her business, JCM Studio of Decorative Arts . JCM Studio of Decorative Arts provides Decorative Painting and Faux Finishing. 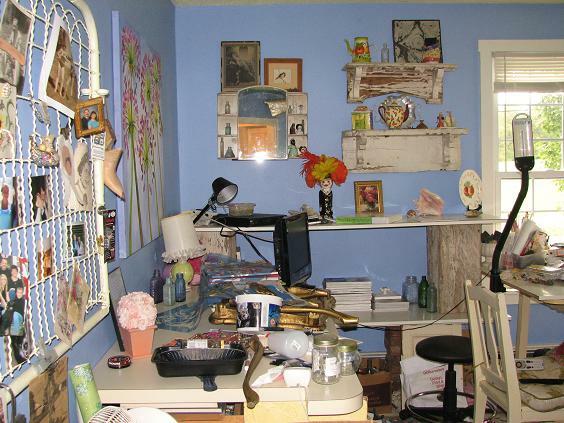 This creative, inventive, and inspired studio space will be the focus of our organizing work and the 2011 Blog A Job!. 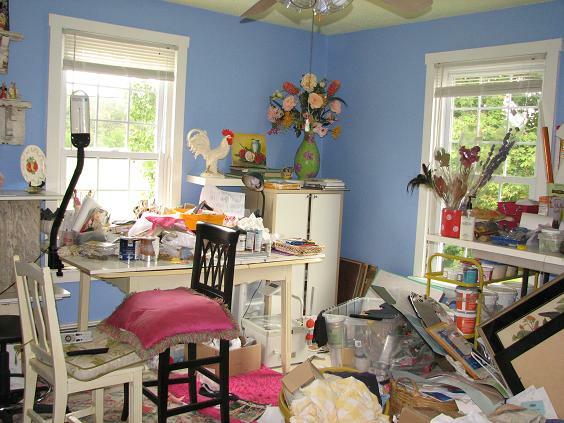 During the In-Home Consultation, Jutz shows me her studio space, which is literally crowding her and her business out. 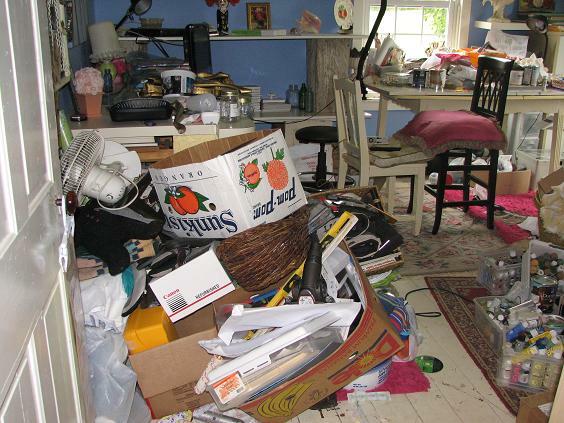 Because of the accumulation of clutter, she is not able to function as she needs to run her business. The consultation is a time for me to ask many questions, as I get a feel for what she needs to accomplish in the space, how she works, what systems she currently has in place, and how we might improve on them or create new systems. At the same time I’m trying to get a picture of her vision for the finished project. How would she like this room to function? What tasks will be accomplished in this room? I take pictures, both to refresh my memory throughout the process, and to motivate us both along the way. 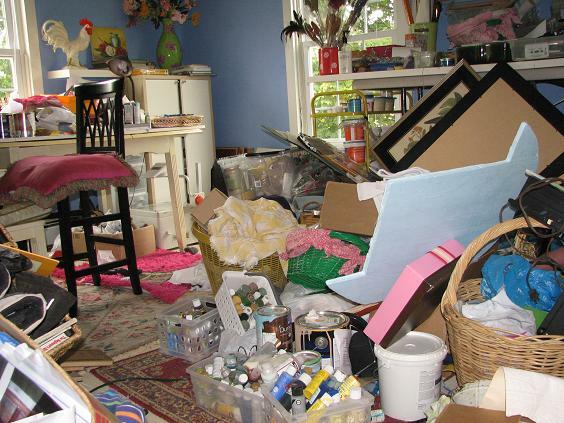 Style Shines Through the Chaos! if given a choice between form and function, I choose form every time. This is not a surprising quote coming from such a creative soul. In other words, she is almost always more concerned with how her space looks, rather than how it functions. 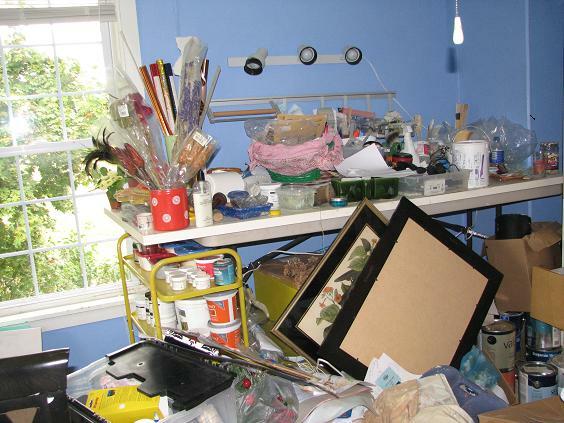 So, clearly, my job is not just to strip it of all the “stuff”, but rather to create stylish, cool, and appealing organizing solutions that Jutz will be able thrive in. In the end, it needs to be both appealing and functional! With this information in hand and pictures in my camera, I can begin to create a plan of action. During our next appointment, the hard work will begin. Next week we will get down and dirty. It generally gets worse, before it gets better. But, as you will soon see, the results are definitely worth it! Check out Blog a Job! 2011 Part 1: Watch a Professional Organizer in Action!, and Part 2: Meet Jutz!, and then check back next week to see how our work progresses. This looks like it will be a great project! I feel like I’m there with you and can’t wait to see as it unfolds! Can’t wait to see an update on this great room with this great gal! Us too! We will be completing the job!